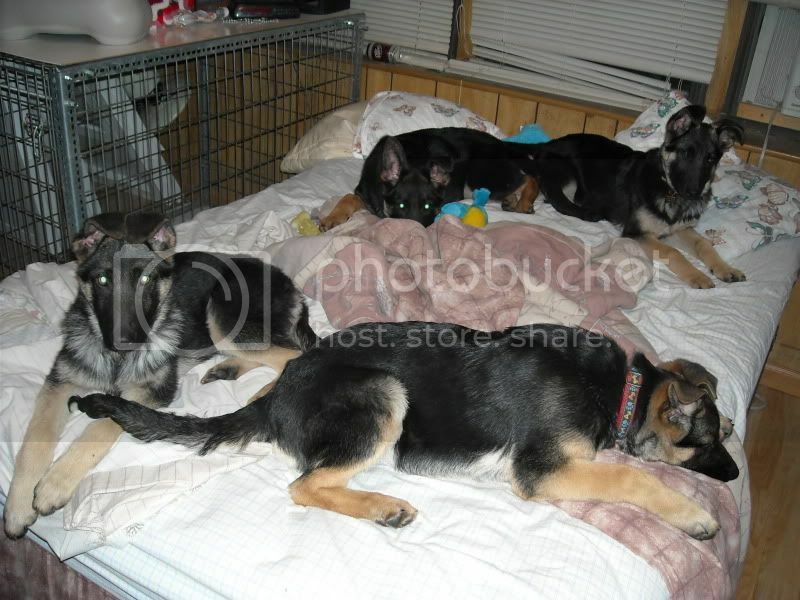 German Shepherd Dog Forums > Special Interest > Weekly Discussion Topics > Is it bad to allow your GSD to sleep in your bed with you? Mine sleeps in our bed. Sometimes Sieger will stay just a bit then move on to the living room. He always starts with me every night until I go to sleep. But if my husband comes in later and the dog is in his spot then the Sieger either hops down or scoots over. But then it gets too crowded so does not stay long. Sieger normally makes it back into bed in the morning to sleep again for a bit. Never had any behavior issues. IF he is too dirty to get on the bed he has a tether in the dinning room and I always have a thick blanket laid out for him on the bed so my sheets don't get dirty...unless the hubby leaves them thrown back when he gets up. I have rolled over to find a 90lbs snoring dog with his head on the pillow THank goodness for King sized beds!!!! I slept with the Hooligans for many years, but one night I just got fed up sleeping with up to 7 GSDs, so I made everyone get off and don't allow them on the bed when I'm in it (but they have access the rest of the time). I'm down to 4 now and sleep much better than I did having dogs shifting around, jumping on and off the bed, etc. My 5 month old GSD has his own bed, and uses it most nights, however some nights I need to go to sleep and he just isn't getting bored or comfy, If I let him in my bed with me he goes right to sleep. Now Im aware this might not be the best thing down the road. But if i continue to do this, is it really going to haunt me in the future? 1. When your dog has to wear a cone. Sleeping with Ninja and her cone was like sleeping with a couple of five year olds and a tobaggon. 2. One day your dog will come in soaked or muddy or skunked or after he rolled on some dead thing, and then directly up on your bed, yay! 3. When your pup is blowing coat, you will itch like crazy sleeping in all that hair. 4. One day you might trap a momma mouse. And than the babies will stagger out one by one trying to figure out where the meal ticket is. And, then Babs, the surrogate momma dog, will bring Jr. Mouse up into the bed with you -- yay!!! Schatzi gets on my bed, but by the time morning arrives she is some where on the floor lol. She does get on the couch. She seems to like the couch more than the bed. My 4 dogs all have the option of sleeping with me. My GSD does every night, the other dogs do when they feel like it (usually they're all up when it's cold, in the summer only the GSD). The only time I have obedience problems is if I've been too sick/busy to get them their normal amount of exercise for a few days, but obviously that isn't tied into where they sleep and goes away as soon as I work them regularly again. I usually go camping/backpacking with my dogs for at least a couple of weekends a month, and one or two week+ long backpacking trips a year, and we all sleep in a pile in the tent during those so I figure sleeping on the bed isn't much different. I grew up doing that so it just never really occurred to me not to let my dogs on the bed. I'm also very strict about a "move" command--they need to arrange themselves around my partner and I, not the other way around. I sleep better with my dogs around though, and have trouble falling asleep when they're not with me. Especially because before I moved in with my boyfriend a month or so ago, I was living alone in a very remote area--very comforting to be surrounded by a pile of dogs! Actually the biggest problem I have is training my boyfriend not to encourage Hector (the GSD) to climb all over him in bed and take all the covers. My boyfriend loves Hector and thinks it's great fun. But that's not the dog's fault! We recently lost our 8 year old GSD "Nikki" to cancer. She was a great dog, but slept on the floor at the foot of our bed on her own bed. Prior to Nikki, we had a Doberman that would sleep on our bed. How we managed that I will never know, because he was 100lb of solid dog! We currently have a 6 mos old female GSD but have no plans on letting her sleep on our bed. The several cats that do sleep on our bed would not like it very much! LOL! Sometimes I let Noah nap with me on bed...but he's way too big to sleep with me at night! I have a twin bed, so it's really small. this was a nice post..i liked it..& yes i did giggle a lot too.. but i agree that dogs do cause allergies & are not unhygenic..you can make them with you for some time but not the whole night..
To each his own. I shower every day but my dog does not so I don't want his dirt and hair in my bed, but I know enough people who do who don't have discipline problems with their dogs. Same here, GSD shed a lot, and I shower in the morning and at night because I like things clean I cannot imagine sleeping in your dog's fur and slober. What I do if say im in the bedroom studying and don't want the dog to be separated from me, I put extra blanket on the top of my bed and the dog lays down on it. but not under the comfroter and not on the sheets, yuk.